Sign in to PBS LearningMedia to find multimedia resources that will enhance learning. 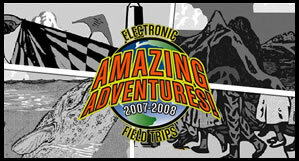 Tune In to Live Field Trips! Every fall, gray whales migrate from cold northern seas near Alaska all the way south to warmer waters off the shores of Mexico. This 6,000-mile journey is the longest migration of any mammal, and it provides a spectacular scene for visitors. In this EFT, we'll also get up close and personal with these giant mammals who range from 40-50 feet long and can weigh up to 73,000 pounds. We will learn about migratory patterns, life cycles, dangers faced by gray whales, ecosystems, research, and how we can protect these majestic mammals. The Smithsonian Kite Festival is a spectacular event that is traditionally part of the National Cherry Blossom Festival on the National Mall in Washington, DC. Kite flyers attend from the U.S. and all over the world, filling the skies around the Washington Monument with color and beauty. Classroom students will be witnesses to the pageantry as they create their own kites, learning about math and science concepts along the way. A particular emphasis will be on the power of wind and weather. This EFT is specifically geared toward younger students, suitable for grades K-5. Archaeological discoveries, DNA, climate science and oral tales cast light on India's deep past. Airs from 9-10 p.m. R 1/9 at 1 p.m. Explore the revolutionary years after 500 BC, the Age of Buddha, using archaeology and legend. Airs from 10-11 p.m. R 1/16 at 1 p.m. Airs January 10-12 from 3:30-5:30 a.m. and Janaury 13 from 3:30-4:00 a.m. This series helps students learn about different cultures by going on exciting journeys of discovery with children who guide them through their everyday life. In each lesson a child introduces his/her surroundings, the architecture, favorite secret places, friends, family and everything that makes up a particular day in that city.